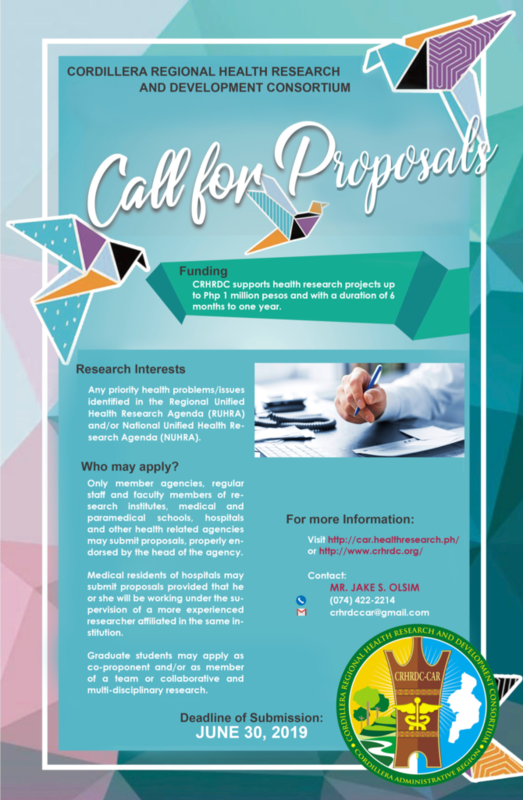 Research proposals that will be entertained by the CRHRDC and PCHRD are those which address priority health problems/issues identified in the Regional Unified Health Research Agenda (RUHRA) and/or National Unified Health Research Agenda (NUHRA). The proposals should also have a budgetary requirement not exceeding ONE MILLION PESOS (P1,000,000.00), and have a duration of six months to one-year.Who may apply? Only member agencies, regular staff and faculty members of research institutes, medical and paramedical schools, hospitals and other health related agencies may submit proposals, properly endorsed by the head of the agency. Likewise, medical residents of hospitals may submit proposals provided that he or she will be working under the supervision of a more experienced researcher affiliated in the same institution. Graduate students may apply as co-proponent and/or as member of a team or collaborative and multi-disciplinary research.What are the contents of the proposal? The proposal content/format can be downloaded HERE.